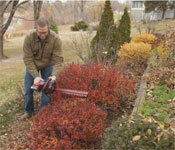 Toro’s new hedge trimmer is powerful and durable, with high-performing features that make yard care seem effortless. The ergonomic handle rotates 90 degrees in each direction providing superior ease of use and accessibility. The powerful 24-volt Lithium-ion battery provides a longer run time and with the rapid charger, the unit will be ready in an hour. Freedom of a cordless design: no gas or oil mess, just charge and you can trim anywhere. 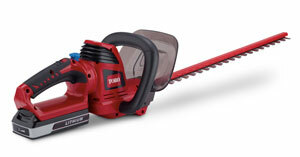 Toro’s powerful, extended-life, 24-volt max* hedge trimmer provides a cutting width of 24 inches for extended reach and offers a cordless design that makes it easy to access hedges just about anywhere–great for larger yards where a cord just won’t reach. The trimmer’s not only lightweight and easy to use, but it also runs quietly, which both you and your neighbors will appreciate. Even more, the hedge trimmer’s ergonomic handle rotates 90 degrees in each direction for convenient accessibility when trimming vertically, and its dual-action blades greatly minimizes vibration when compared to a single-blade hedge trimmer. With its soft-grip assist handle for reduced hand fatigue, the hedge trimmer measures 8 by 8 by 36 inches and carries a two-year warranty. Lithium-ion design provides up to twice the power per weight versus traditional nickel-cadmium batteries. Longer run time with no memory effects and low self-discharge means the battery is ready when you are. The on-board LED charge meter displays the battery status. 24-inch-long cutting bar with polished, hardened-steel dual-action blades provides outstanding durability and extended reach to get the job done faster. It easily cuts through branches up to 5/8-inch thick. The handle rotates 90 degrees in each direction, making trimming vertically easy and comfortable. The work grip handles help reduce hand fatigue and improve comfort while trimming.